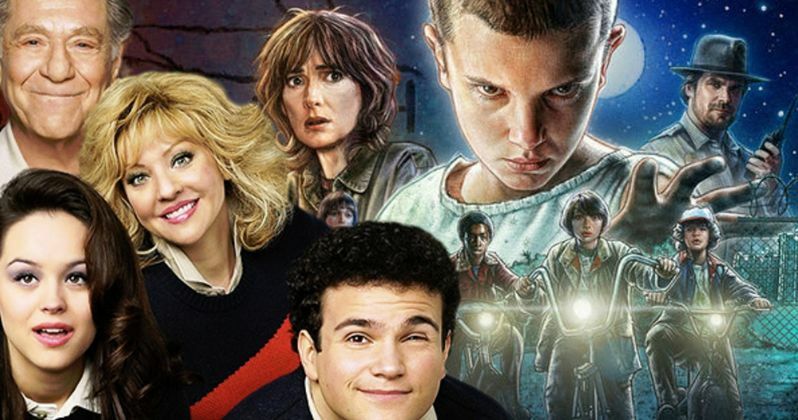 Back in August, The Goldbergs creator proclaimed on Twitter that he is "100% game" for a crossover between his ABC series and Netflix's white-hot sci-fi series Stranger Things, which was given the seal of approval by Stranger Things producer Shawn Levy. It seems that this crossover is more than just Twitter talk, with Adam F. Goldberg revealing in a new interview that he does have an idea of how this crossover just may work. Here's what he had to say below. "The crossover I want to do is Stranger Things. I have a scenario in my head that I don't want to spoil. The producer of [his upcoming ABC comedy] Imaginary Mary [Shawn Levy] is also a producer and director of one of the episodes of Stranger Things. We've discussed what that would look like, which is really cool." This revelation came in a new interview with TV Line, although, unfortunately, Adam F. Goldberg would not reveal any details about his crossover plans with Shawn Levy. It isn't known if Netflix would be on board with this crossover, and if they would allow their young stars to pay a visit to The Goldbergs. The ABC series is no stranger to referencing movies and TV shows, with their Season 4 premiere airing tonight paying homage to the 1980s classic The Breakfast Club. Both The Goldbergs and Stranger Things are both set in the 1980s, with The Goldbergs set in Philadelphia and Stranger Things set in the fictional town of Hawkins, Indiana. It's worth noting that Stranger Things creators The Duffer Brothers, originally wanted to call the series Montauk and have the show set in Long Island, here the infamous Montauk monster surfaced years ago. The show's filming locations in and around Atlanta, Georgia could not pass for a beach environment, so they changed it to Hawkins, Indiana. We reported last week that production seems to be under way on Stranger Things Season 2, which will span nine episodes, will be set in the year 1984, one year after the events of the first season. Winona Ryder, David Harbour, Finn Wolfhard, Gaten Matarazzo, Caleb McLaughlin, Natalia Dyer and Charlie Heaton are set to return. It's possible that, after filming Season 2, the Stranger Things kids could be available for a crossover in the back half of The Goldbergs Season 4, but nothing is set in stone yet.